As the United States entered the Great War, the science of ASW was being invented. The U.S. submarine chasers were an important component in both the testing and implementation of early ASW devices. Several new sets of photos are posted this month, thanks to Roy Manstan and the Harvey Hayes Family Archives. One set, showing the trailing wire device, is particularly exciting -- to me, anyway, since these are the first photos I've seen that clearly show the indicator device and the wire apparatus. The purpose of the trailing wire was to detect submarines on the ocean bottom, "playing dead" to avoid detection by listening devices. The chasers would run abreast across the suspected area where a sub might be hiding, trailing the wires along the ocean bottom. When the phosphor-bronze wire or the detector weight on the end of the wire struck a metal object, a small electrical current sounded an alarm in the indicator device in the pilot house. In actual ASW operations, while the device was reported to have been employed at least early on, sailors' reports suggest that it was considered impractical. It's likely that it was abandoned in live ASW operations. In some areas, such as in the Otranto Barrage, the ocean depth rendered the device unusable, and it was removed. Still, it stands as an important and interesting step in the development of ASW devices and tactics. See also the photo sets on the position plotter -- another rare, exciting set of photos -- and the set on other plotting tools. 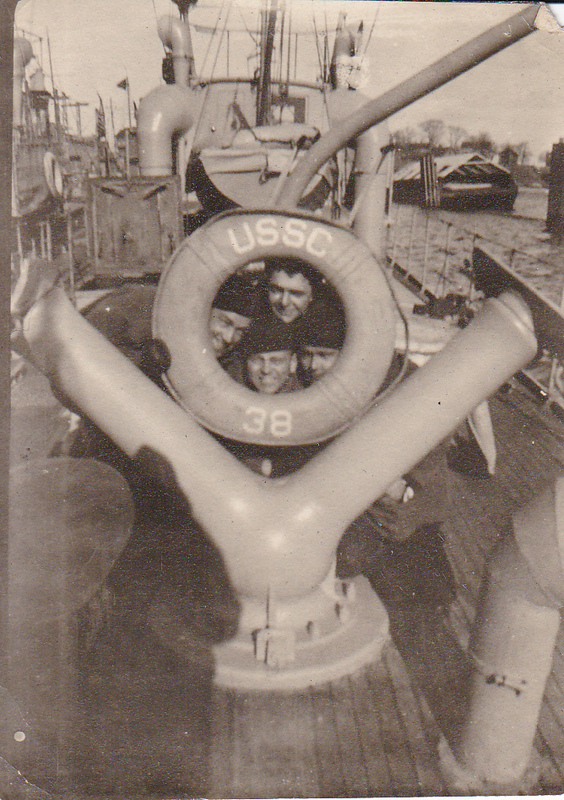 Recently posted is a set of crew photos from submarine chaser SC 38. This set shows, among other crewmen, ship's cook Wayne Anthony. Thanks to Glenn Jones for submitting the photo set.